Yet, in the event of a victory on September 18th, the SNP will close down the official ‘Yes’ campaign, just like Barack Obama closed down the ‘Yes We Can’ campaign, when he was elected President in 2008. The corporate suits came out of the closet and began the process of rebranding US imperialism. The SNP government’s own ‘ I n d e p e n d e n c e – L i t e ’ proposals already accept the monarchy (and hence long arm of the Crown Powers), sterling (and hence economic rule by the City of London), and Scottish armed forces subordinate to the British High Command and NATO. They want to offer the global corporations discount taxes, highlighted already by their fawning before taxevader, Amazon. SNP government minister, Michael Russell calls this “independence within the Union”; Jim McColl, CEO of Scottish Blowers terms it a “managerial buy-out”. This is just another rebranding exercise, because the SNP leadership represents the interests of a wannabe Scottish ruling class. To lower our sights and to achieve the SNP government’s own limited aims, they will fall back on their 2011 Holyrood mandate, under the UK state’s 1998 Scotland Act. They want to invite unionist MSPs and other significant Scottish establishment figures into their team to conduct the negotiations with Westminster. The people of Scotland will be locked out of this process. The negotiations will be conducted in secret. Secret protocols can not be ruled out either. The UK Crown Powers ensure that significant aspects of the British state lie beyond even Westminster scrutiny. Senior military figures are already planning how to remove Faslane from any Scottish jurisdiction in the event of a ‘Yes’ vote. Salmond, far from challenging all this, is eulogistic in his support of the Crown. Therefore, the decision of RIC to have a discussion on ‘What happens after September 18th’ is very significant. A ‘Yes’ vote is not a mere negotiating ploy, nor an indicative ballot, to be disposed of by the SNP government as it sees fit. It is an expression of opposition to the anti-democratic principle of the Crown in Westminster, and a democratic assertion of the ‘sovereignty of the people’. This means the independence negotiations need to be held not ‘in camera’ but on camera. The SNP government’s constituent assembly, proposed in their White Paper, should be elected, and preceded by the widest involvement of people in popular assemblies throughout Scotland. Within two weeks of a ‘Yes’ vote, RIC should invite people from the many campaigns to a special conference. The aim should be to win bigger support than we achieved for the two successful RIC conferences in 2012 and 2013. Thus RIC would place itself in the foreground of those wanting to exercise the sovereignty of the people in practice. This is the only way that the radical vision RIC and many other people uphold can come to fruition. The RCN is putting forward the following points for discussion. Many others will have their own proposals, which we welcome. RIC groups, with the help of other campaigning organisations, can become the focus of a wider debate. This could lead to creating the organisation/s and actions needed to bring about the Scotland and world we want to achieve. * For public research and experimental projects to help move towards less environmentally damaging energy provision Self determination allied to democratic control can unlock the potential of the Scottish people and, by their example, unlock the potential of all the peoples of these islands. From its national launch in 2012, the Radical Independence Campaign has seen the issue of Scottish independence as a democratic issue in a wider UK and European context. There were speakers from several countries, including Catalunya, Euskadi, England and Ireland at our two national conferences. 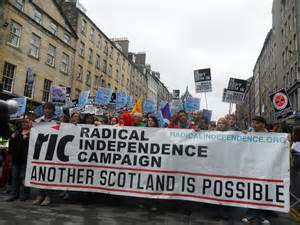 RIC is not a Scottish nationalist but a Scottish internationalist campaign. Jonathan Shafi, RIC national organiser, addressed a conference of the Popular Unity Candidates (CUP), the radical Left party in Catalunya in April. Liam O’Hare, leading RIC activist, now based in Glasgow, addressed the James Connolly Society conference in Edinburgh last October (1). .At an Edinburgh RIC branch meeting held on 14.4.14, James Slaven from the James Connolly Society (JCS) and Queralt Badia from CUP, spoke on The Impact of the Scottish Independence referendum on Ireland and Catalunya. In Scotland, the UK state is allowing a referendum on Scottish self determination on September 18th, because the SNP government is prepared to accept its conduct under Westminster rules (with the anti-democratic Crown Powers being wielded behind the scenes). It has also given an undertaking to do all it can to ensure that Scotland remains part of the UK, militarily subject to British High Command and NATO and to the City of London. However, in Catalunya and Ireland, the Spanish and UK/ ‘26 counties’ Irish states are so opposed to any exercise of self-determination, that moves to hold such a referendum are considered unconstitutional and illegal. To counter this, the JCS is giving its support to the all-Ireland referendum campaign for a united Ireland being organised by the 1916 Society. This is not a demand to be made on the existing states but a campaign for citizens initiative referendum. Like RIC, this is a non-party campaign, supported by republicans and others seeking the support of the most exploited and oppressed in society. Office bearers can only remain in place for a maximum of three years. The 1916 Society rejects current situation in the ‘Six Counties’, where sectarianism is institutionalised. The Unionists are currently trying to restore their supremacy, pushed and backed by Loyalist paramilitaries and street gangs. Tory, Northern Irish Secretary Theresa Villiers has backed the Unionists, by signaling the end of any further public enquiries into the murderous role of the British army, RIC and RUC in ‘The Troubles’, to concentrate solely on the activities of Irish republicans’. The arrest of Gerry Adams was part of this strategy. However, the 1916 Society is an all-Ireland campaign. They do not support the dead-end militarism of dissident republicans. Instead they want to build support for a citizens’ initiative referendum on both sides of the border. They relate this to the issues of austerity, government and business corruption, and the plight of women, gays and migrants in Ireland. They oppose the role of the DUP/Sinn Fein and Fine Gael/Labour coalition governments in attacking the working class in both parts of partitioned Ireland. Thus, they see their campaign for a united Ireland, based on a radical economic and social alternative, in similar terms to RIC’s campaign for in Scotland. After circulating all Edinburgh RIC contacts with the motion above, this was passed at the branch meeting on 14.4.14 by 27 votes for, 0 against and 5 abstentions. In the spirit of Scottish internationalism the Edinburgh branch is seeking the support of the RIC National Forum for JCS backed, 1916 Societies initiative. A ‘Yes’ vote on September 18th represents an expression of ‘the sovereignty of the people’. Political arrangements based under the Westminster principle of the sovereignty of the Crown in Parliament are no longer valid. The official ‘Yes’ campaign will be ended after September 18th. RIC should aim to bring people together soon as possible after this date. The aim would be a bigger convention than the last two RIC conferences. Suggested organisations to be involved could include existing local ‘Yes’ groups, other ‘Yes’ campaigning organisations, organisations which had not been able to take a ‘Yes’ position but may now want to become involved in the making of a new Scotland, e.g. trade unions, community organisations, specific campaigns, e.g. disability. On this basis regular wider forums (people’s assemblies) would be held in as many areas as possible to influence the negotiating and constitution-making processes. There should be a rejection of the idea that the negotiating team with Westminster should be confined to those chosen by the SNP government. 2a. One suggestion was a whole new negotiating team should be elected. b. An alternative suggestion was that an alternative list of representatives be put forward to supplement the SNP government representatives. The negotiations should be held in public (on camera rather than ‘in camera’), with the proceedings televised. There should be a mechanism by which the negotiating team can report to the people of Scotland, whose views should be heard. There should be some immediate demands, e.g. 1a. One suggestion was that the constituent assembly proposed in the White Paper should be an elected body. b. An alternative suggestion was that members of the constituent assembly should be drawn by lot, like juries. The calling of a constituent assembly should be preceded by a mass consultation exercise, which involved people in every community in Scotland. The aim of this would be to draw up a Charter to form the basis of a new constitution. Various features should be enshrined within the constitution, e.g. Should produce a discussion paper (e.g. a shortened version of the paper presented to the Edinburgh branch for wider distribution in RIC). Should produce a leaflet with the timetable of the processes involved in negotiations and constitution-making for wider distribution to local ‘Yes’ group and other ‘Yes’ campaigning organisations, etc. Unfortunately, there is one crucial demand missing in the ‘Workers Rights’ section of the ‘Support the Struggle for Real Self-Determination in a Scottish Democratic, Secular and Social Republic’. That is opposition to the Blacklist, which is very much a current issue, which the RCN has been involved in and also covered on this blog. One item missing from the demands in the ‘Workers Rights’ section of ‘Support the Struggle for Real Self-Determination in a Scottish Democratic, Secular and Social Republic’ is the call to ‘Scrap the Blacklist’. The RCN has also campaigned for many years against the blacklist, and several article can be found on this blog.